Do you want a cozy-cottage look for your home? 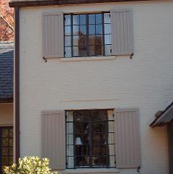 Duke Shutter Company in Acworth, GA, provides and installs charming board and batten shutters. They are relatively easy to make, consisting of 2 to 4 vertical boards attached with 2 horizontal battens. However, it's critical to use quality materials and adhere to exact measurements. That way, your board batten shutters will last longer. 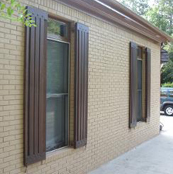 In addition to providing a uniform appearance, properly installed board and batten shutters offer years of enjoyment. When you want premium board and batten shutters that are built to last, there's no need to look further than our window shutters company in Acworth, GA. Available in a wide variety of colors and styles, you'll enjoy affordable shutters and complete installation services without having to lift a finger. From vinyl shutters to wood board and batten shutters, we cater to your needs. As fully licensed and insured company in Acworth, GA, we know everything there is to know about building and installing shutters. Our stylish board and batten exterior shutters create dramatic impressions for any home. There's something timeless and "old world" about wood board and batten shutters. Whether you want a European-estate appearance or a rustic cottage feel, wood board and batten shutters are the solution. From simple to completely customized shutters, our products are always built with your needs in mind. They offer a cute, cozy, and cottage-feel that adds value and charm to your humble abode. Enjoy fade-resistant and rot-proof board and batten vinyl shutters that last a lifetime. They look like wood, but are more affordable. Choose from a variety of colors to accent your home. 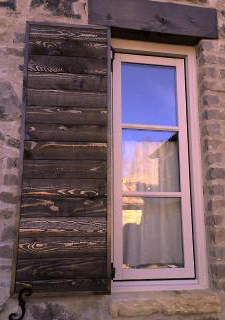 These board and batten exterior shutters are extremely durable and available in many styles as well. Contact Duke Shutter Company for time-tested and rustic board and batten shutters when you want an Old-World look for your home. We proudly serve customers in Acworth, Kennesaw, Canton, Woodstock, Marietta, Smyrna, Dunwoody, Johns Creek, Alpharetta, and Roswell, Georgia.